My paternal grandfather George Lade was born in Hailsham, Sussex but after marrying Kate Yates in 1910 they decided to emigrate to Australia where their first two children were born. However, on a holiday visit back to Brighton in 1914 World War 1 was declared and so George decided to join the 12th Battalion Royal Sussex Regiment, known as the “Lowther’s Lambs”. On the 30 June 1916, twenty four hours before the much better known ‘First Day on the Somme’ the battalions of the Royal Sussex suffered nearly 1,100 casualties near Richebourg l’Avoue, Northern France. George was shot in the head, lost the sight of his left eye, and was gassed. After the War George moved his family, wife and the first 5 of their 8 children, to Brighton where over the next sixteen years he ran a number of shops in particular Fruiterer & Grocers at Preston Road, Terminus Road just outside Brighton Station, and Westbourne Street, Hove. He also became well known in the Brighton Open Market. 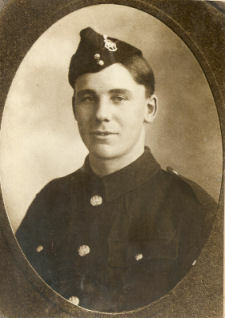 He became a member of the Brighton branch, British Legion. George died at the age of only 50 on the 5 January 1939 mainly due to his war injuries and was buried at the Brighton and Preston Cemetery on the 10 January 1939. His funeral was reported in the Brighton Evening Argus. Since his burial the ashes of his wife, one of his daughters and son in law have been added to his grave. Particularly remembering my Granddad today as it is the 100th anniversary of the Battle of Boar’s Head.